Day two of our exile in mechanical trouble land. Although I awoke early in anticipation of the mechanics being at the boat early, answer in hand, it did not transpire according to my optimistic timetable. I held my ground until 10AM when I called Frank, the boss, to see what the plan was. They were in the process of constructing some special hoses to allow them to try a couple of bypass workarounds. Also, they had sent the computer print outs to those who can decipher them. They hoped that the mechanics would be down later in the morning once the hoses were complete. Since they encouraged us to entertain ourselves by enjoying Sidney, (not an encouraging sign from our perspective) we acquiesced given that we were sick of looking at the inside of Arctic Star. Sidney is a town of ten bookstores, all within a few blocks of the docks. So off to browse the bookshelves we went. Sidney is indeed a great town of bookstores with anything you can imagine available within a ten minute walk. After buying some new reading material we stopped at Fish on 5th for lunch. Turns out that this little, unimposing restaurant, knows its fish. I had halibut and chips (yam fries instead of white potatoes) and Karen enjoyed a fish taco. We both left satisfied. As we walked back to the boat, we ran into Nigel pushing his wheelbarrow full of tools, diesel fuel soaked rags and the offending part. Today’s trouble shooting was fruitful and the offending part was a stuck check valve in the primer pump. Nigel was heading back to the shop to see if he had a replacement part. 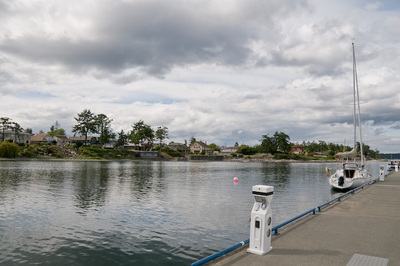 It was about 1PM now so we strolled back to Arctic Star via a circuitous route up and down the finger piers checking out the myriad of boats docked in Sidney harbor. Big, small, old, new and everything in between was laid out for our perusal. We often talk about the size of the tides in this part of the world. 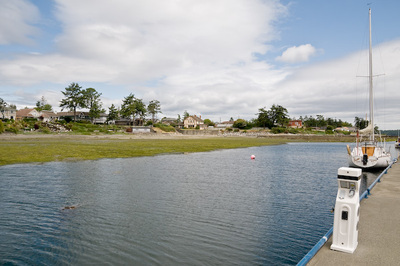 In Sidney harbour the impact of the wide tidal range is driven home at the back of the harbour. The tidal mud flats cover and uncover with dramatic effect. Around 2:30 Nigel returned with a brand new primer pump in hand. About a half hour later Nigel had the engine running and happy. It was too late to cast off, especially given our destination and the forecast winds. So a celebration dinner was the plan, and we walked a few blocks to the Thai restaurant. 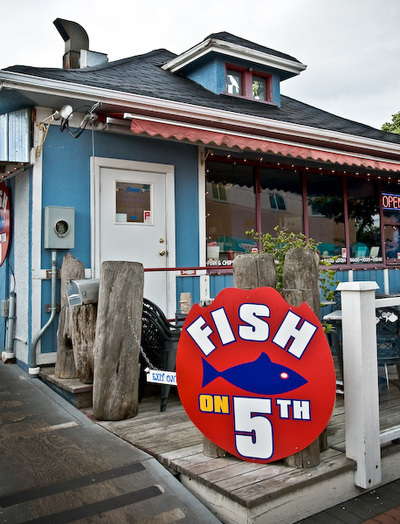 Nothing fancy, but very popular and some say the best restaurant in Sidney. We enjoyed our dinner, followed by some ice cream aboard Arctic Star and early to bed. Tomorrow, we bid fond farewell to Sidney and return to our vacation.